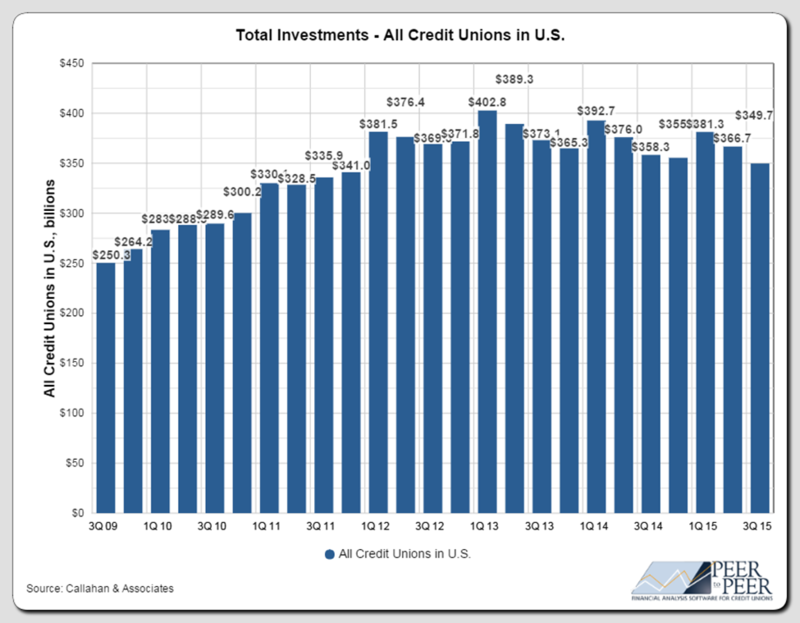 According to the latest Investment Trends Review published by TRUST for Credit Unions, total credit union investments declined by $17 billion from the previous quarter’s total of $367 billion but still comprise a third of total credit union assets. This significant chunk of industry assets requires attention and active management even as credit unions continue to focus on lending. Balances Continue To Decline, Funding Loan Growth. As of Sept. 30, 2015, credit unions held more than $350 billion in investments. As the chart below shows, total investments decreased $17 billion from the previous quarter’s total of $367 billion, continuing the trend of credit unions funding more loans. Total credit union assets remained steady at an all-time high of $1.18 trillion. The industry’s loan-to-share ratio increased, rising from 75% in the 2nd quarter of 2015 to 77% in the third quarter of 2015 accounting for the decline in investments. With industry investments remaining at higher levels and yields on those investments at record lows, many credit unions are searching for flexible alternatives that can enhance yield without tying funds up long-term. Download your complimentary copy of the Credit Union Guide to Mutual Fund Investing now. 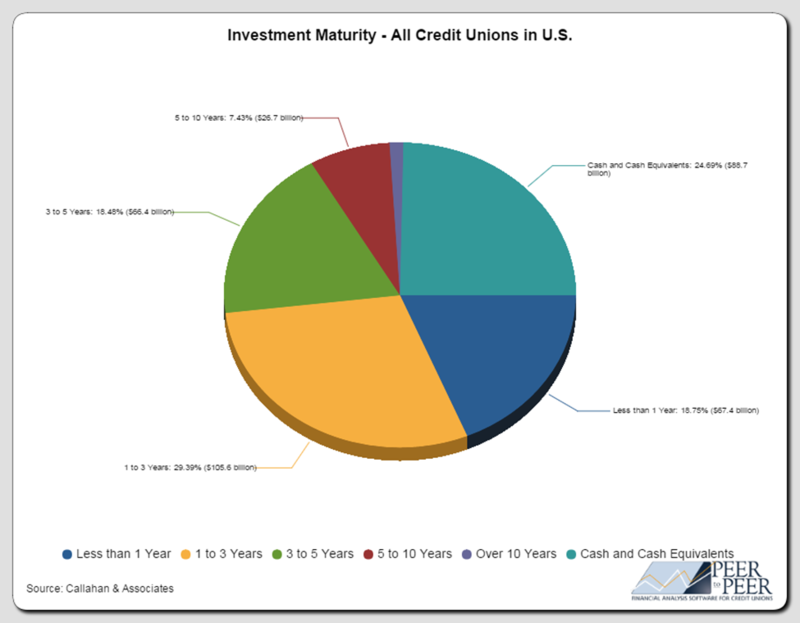 The average investment maturity for all U.S. credit unions was unchanged in the third quarter of 2015. Securities longer than five years totaled $31 billion, representing less than 9% of total investments. Many of these longer-term securities are longer-maturity callable agencies and longer than expected average life CMOs that have been placed into the held to maturity (HTM) bucket. If rates were to rise, the “price” risk would be mitigated due to this fact. In addition, 25% of the entire portfolio is held in cash, providing a buffer in the event of another rate crisis. Interested in more information about the overall industry’s average yield on investments, portfolio composition and weighted-average life? Download your complimentary copy of the full Q3 2015 Investment Trends Review from www.trustcu.com today or contact us at TCUGroup@callahan.com to pre-order your complimentary copy of the upcoming Q4 2015 Investment Trends Review for your credit union. TRUST helps credit unions succeed in serving their members by providing a professionally managed family of mutual funds – exclusive to credit unions – as well as the information and analysis they need to support investment decisions. Created by some of the leading credit unions with oversight by a board of trustees, TRUST’s mutual fund options allow credit unions to meet their short duration needs, are professionally managed, and are based on the cooperative values of credit unions. The Trust for Credit Unions (TCU) is a family of institutional mutual funds offered exclusively to credit unions. Callahan Financial Services is a wholly-owned subsidiary of Callahan & Associate and is the distributor of the TCU mutual funds. Goldman Sachs Asset Management is the advisor of the TCU mutual funds. To obtain a prospectus which contains detailed fund information including investment policies, risk considerations, charges and expenses, call Callahan Financial Services, Inc. at 800-CFS-5678. Please read the prospectus carefully before investing or sending money. Units of the Trust portfolios are not endorsed by, insured by, obligations of, or otherwise supported by the U.S. Government, the NCUSIF, the NCUA or any other governmental agency. An investment in the portfolios involves risk including possible loss of principal.